Flaunt It! Monday is back! If you’re still in holiday mode and miss out then us working folks can’t give you anymore sympathy! Today’s review is this great reusable shopping bag from The Green Apple. I had the opportunity to use this bag Saturday for my big monthly shopping. I have about half a dozen or more of the $1 bags you can pick up from various grocery stores and this one got added to the bunch. The fact that I remembered them is amazing in itself! My bagger at checkout showed no mercy on these bags either, so it was really put to the test. More on my thoughts in a bit. The Green Apple Bag is a high quality bag utilizing Woven RPET, a durable eco-friendly material made of post consumer recycled plastic bottles. Instead of ending up in landfills, these bottles can be used for a sturdy material which will be able to be used for years to come by you and your family. Woven RPET material is one of the highest quality fabrics found on the market today. This material gives a unique quality and caliber over many bags sold worldwide. We are proud to be able to provide a healthy, yet classy, solution for the environment. We think you will agree. I do agree! I was amazed how soft the material is! This was the first product upcycled from plastic I have had the opportunity to use and I was impressed. When I first got the bag I had my friends and family check the bag out and guess what it was made with. Since they know how I am always reviewing all these green products they gave a shot with answers like hemp or organic cotton. Their eyes popped when I told them soda bottles! As I mentioned, I had a bagger this weekend that showed no mercy. He stuffed the bags overfull. Since this bag is much taller (17” tall x 13” wide x 6.5” deep & 25” long handles) then the others, it took the worst of his abuse. The bags were insanely heavy, and I did hold a few of my dollar bags on the bottom for fear of busting them. However, I carried the Green Apple Bag on my shoulder and it passed the test. The material is great and the quality is top notch, with an embroidered logo and front pouch for shopping list, keys or any other small items you may want to use it for. Use the share button on this button for any of the other social bookmarking options. Email 3 friends about this giveaway using the new Eco-Safe buttons on the bottom of this post. Copy jsmith at eco-officegals dot com in the email. Subscribe to the Eco-Office Gals feed so you don’t miss out on all the great green info, reviews and giveaways! Leave a separate comment for each one you do! Each comment is an entry. US residents only please. Winner will be announced Wednesday 1/14/09 … Good Luck! As info I subtracted myself from the entry count. Green/Eco-friendly things can be quite chic! I have a pretty bag with wheels that I use for yard sales and festivals. I keep it very accessible at my front entryway. Also follow Lesa Rossick / greenapplebag on twitter. I keep my reusable bags in the car and also have one that folds very compactly in my purse. http://tinyurl.com/7nv3v9 last day to enter to win a great bag upcycled from soda bottles from The Green Apple Bag! Connie´s last blog post..Win a Deluxe Pink Princess Costume! RT @EcoOfficeGals http://tinyurl.com/7nv3v9 last day to enter to win a great bag upcycled from soda bottles from The Green Apple Bag! http://tinyurl.com/7nv3v9 Flaunt It! Monday: The Green Apple Bag Giveaway! http://tinyurl.com/7nv3v9 last day to enter to win a great bag upcycled from soda bottles from The Green Apple Bag! be sure to enter! I leave my bags in my car and try to put them on top of my purse before I go into a grocery store! 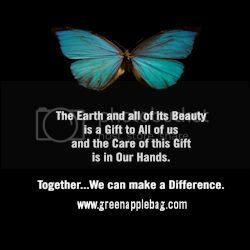 I am following Green Apple Bag and Eco-Office Gals on Twitter … Tweeted about your bag and will be blogging later today. I am following Green Apple Bag on Twitter. I keep my green bags everywhere. I have them in the front seat of the car, in the van. I also hang them from the front door so I see them on the way out. My kids play with them so they are all around the house. Stumbled Green Apple Bag site. I have two bags that are very thin material and can be folded small in my purse and the rest on the front seat of my van. I still forget them sometimes but I am getting better! I make it a point to keep my bags in the car otherwise I will forget them! I subscribed with Blog Lines. I roll up my reusable bag and take it with me in my purse. I follow both the Green Bag Apple and EcoOfficeGals on twitter as janetfaye. Don’t forget to make a post on the website to enter the contest! Good luck! http://tinyurl.com/7nv3v9 Flaunt It! Monday: The Green Apple Bag review & giveaway! Get your entry in for this great bag! I hang my bags on the hook with my keys, so I can’t leave the house without seeing them. My tip for remembering my reusable bags is to immediatley hang them on my doorknob to the garage after I empty them in my kitchen. Then, the next time I go to the car, there they are. I immediatley put them in the car and they’ll be there for my next shopping trip. i keep reusable bags in the trunk of my car so i have them when i need them. thanks for the giveaway!! I remember my bags by first hanging them on the house door knob to be returned to the car, and second, by keeping them in the front seat so I see them when I arrive at the store. I remember my bags by after using them I roll them up so there small and put a rubberband around all of them and then I put them in my purse. This bag sounds nice, I’d love to be entered! My tip is alway put the bag back into your car after you unload the groceries. Obviously I don’t remember to bring my reuseable shopping bags because I don’t have any! But, if I won this one, I would keep with with my keys so it would go back into the car my next trip out! Great blog. Welcome to MBC! I love my reuseable shopping bags! I empty them in my kitchen & put them straight out by the front door, so I will remember to take them out. I have been known to leave them in my car when shopping & what I do then is just pile them BACK into the cart & bag them when I get to the car! Following Green Apple Bag on Facebook. Following you on on Facebook. I keep my reusable bags with my coupon binder so that I can grab them all as I go out the door…I NEVER forget my coupon binder so now I never forget the bags either! I hang my reusable bag on a hook next to the door so I never forget it when I leave for the store. I also have a spare bag in the trunk of my car. i tried to always keep bags in the car, but then would forget to take them in…now I keep them hanging next to the garage door so i see them every time i go out if i’m on my way to the store, i grab them, and put them in the front seat next to me so i don’t forget them. Following you on twitter @terpsichore! RT @EcoOfficeGals: http://tinyurl.com/7nv3v9 The Green Apple Bag, top notch quality made from upcycled plastic bottles. Enter to win one. http://tinyurl.com/7nv3v9 The Green Apple Bag, top notch quality made from upcycled plastic bottles. Enter to win one. http://tinyurl.com/7nv3v9 Flaunt It! Monday: The Green Apple Bag Review and Giveaway! This bag is awesome! Check it out. http://tinyurl.com/7nv3v9 Flaunt It! Monday: The Green Apple Bag. Check out this GREAT bag! !